Run your field service business better with a comprehensive mobile-first solution. 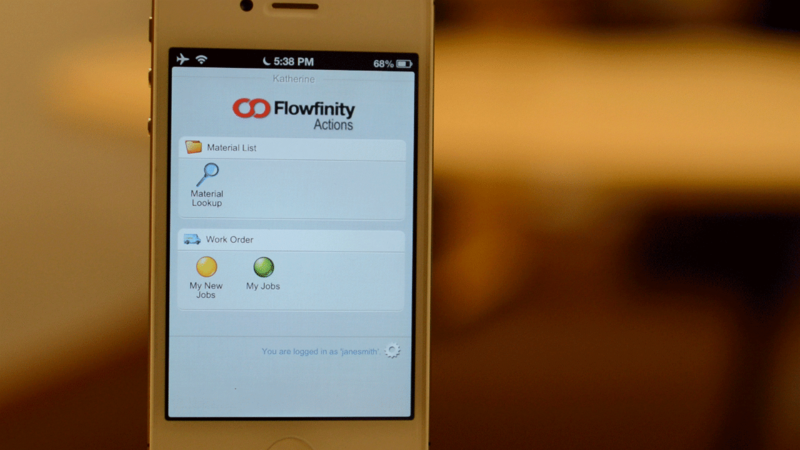 Manage all of your work order forms with Flowfinity mobile apps. Look up parts and customers, capture pictures, signatures, and GPS locations, and achieve more accurate and up-to-date records of all work performed. Flowfinity supports two-way information, so field staff can also look up past service records on mobile devices to see which services were delivered previously. Close jobs faster and speed up cash flow. With real-time, accurate information being submitted from the field, you can review and close jobs sooner. You won't have to wait for paper forms to be submitted or spend time reconciling reports. That means you can invoice faster and speed up cash flow. Streamline dispatch and task assignments. Dispatch jobs from the office to field technicians' mobile devices, wherever they are. Set up workflows so that your field staff can accept or reject dispatched jobs. You can also assign jobs or tasks to anyone with a certain user role or branch office. Improve employee accountability for parts management and achieve more accurate job costing by storing all of your parts and assets in a central database that can be accessed from mobile devices, anywhere. Ensure that field technicians enter accurate part information into every mobile work order, online or offline. Keep better track of where your field employees are and what they are working on. Record the time in, time out, and GPS location at each job, require time-stamped photos, and more. Report on trends over time to review each employee's performance. Set up workflow steps in your mobile forms to guide field technicians through proper procedures. Include data validation and error messages for any rules that you specify, such as a reading being too high or low. Include attachments for instruction manuals or equipment information. Keep better track of billable hours and invoicing. With all of your service records in a centralized, searchable database, you can run reports, locate invoices, and keep better track of billable hours. Color-code your data to quickly see which jobs have been invoiced and paid. Delight your customers and increase retention with real-time reports of all services rendered. Have customers sign mobile work order forms electronically and send them automated emails from the field as soon as work is complete. Stay agile and update your workflow apps anytime. Business is always evolving. When customer requirements, regulations, or your business workflows change, you can update your mobile apps and forms anytime with our point-and-click app editor, and publish the changes instantly to all users. You can use Flowfinity as a stand-alone solution, or if you are using other systems, you can easily integrate your data to avoid inefficient manual data transfer processes. Take advantage of deep links for seamless use with other apps on-device such as mapping applications. For back-end integration, use our web services API to integrate with your existing data warehouse, ERP, CRM or other system. "Our revenues are up 25%, profits are up, and we're doing more activity and closing more calls now. Overall Flowfinity has been a perfect fit for us."